2017. Well, what can we say? This year has seen us raise the bar for search marketing and stand atop the pile as one of the UK’s leading independent search marketing agencies, and we’ve got the gongs to prove it. 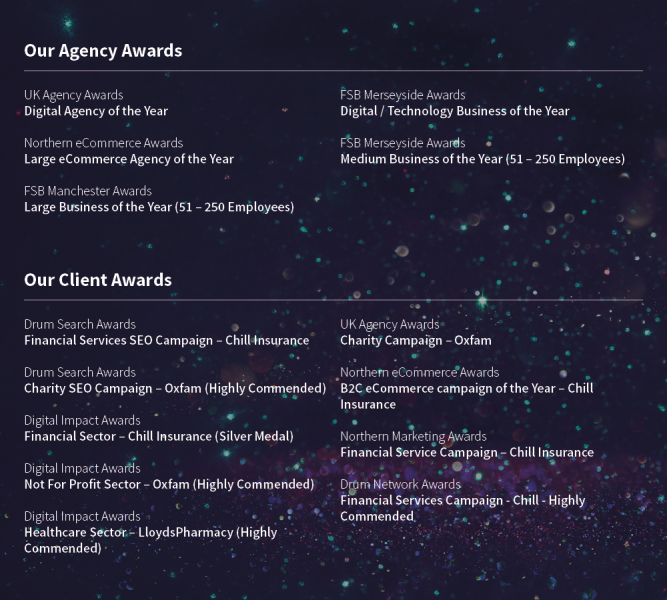 Since the start of 2017 we have been shortlisted for an incredible 54 awards, both as an agency and on behalf of the work we have undertaken for our clients. What’s more, we took 14 of them home, and here’s our roll of honour! Speaking about our successes this year, Click Consult’s Founder and CEO, Matt Bullas said: “This year has been truly transformational for Click Consult and I couldn’t be prouder of the team. “We have spent the last 12 months refining our proposition and that has led to us opening doors to new brands and delivering huge success for our existing clients. “To win five agency awards is a huge honour and shows just how much we have evolved. We can now truly say that we are one of the largest independent search marketing agencies in the country and our trophy cabinet is a testament to that. As this year has been our most successful to date, we thought that we’d look back on a fruitful awards season and tell you about some of the great campaigns that we’ve been winning with. We have seen a huge amount of growth over the last 12 months, including significant increases in the number of clients and fees as well as the continued development of staff, in-house technologies and the growth of our own industry leading conference – Benchmark Search Conference. Our vision is and has always been to achieve a high level of thought leadership within a rapidly changing industry, to lead rather than follow and to do all of this ethically and sustainably. This is reflected by ever increasing status of our client wins and breadth of industry recognition – a testament to the skills and dedication of our people. Our data-driven strategies are unique to each individual client, with integrated approaches focused on delivering impressive ROI. We have exacting standards about the technology we use – and if nothing exists, we develop our own. We ensure that creativity is at the heart of every campaign. We maintain transparency, ethics and honesty in all our partnerships. We pride ourselves on staying several steps ahead of the search marketing curve. Our team is comprised of passionate search marketing professionals who have a reputation for delivering results. Our aims at the start of 2017 were to see an increase in the number of clients, (especially large brands) fees, retention percentages, revenue and profit. All of which we have achieved. This year we have focused on our people and have increased the number of staff in client facing roles from 40 to 58, a 45% increase on last year. Below is a snapshot of some of the result that we have gained for our clients. The outstanding results both delighted the client and exceeded their expectations. In fact, the improvements in organic traffic allowed Chill to reduce their paid search spend dramatically, with a cost saving of up to €90,000 whilst improving performance. Charities are often one of the most under-represented areas of the industry yet they require effective campaigns to reach their targets. The campaign designed by Click Consult offered a mixture of multi-media asset creation which would not only harness genuine empathy for the globally respected brand, but help them achieve a greater share of this valuable market. As a globally recognised brand, all assets needed to be not only of great quality, compelling and unique, but also able to blend seamlessly with the existing Oxfam assets and branding strategies, while dynamic enough to be regularly updated to take advantage of and build upon pre-existing seasonal peaks in traffic. We know that whilst traffic fluctuated before partnering with us the results achieved are now flourishing. Our constant drive for improvement means that Oxfam have and will continue to grow in their market both financially and in terms of brand awareness. LloydsPharmacy Online Doctor first approached Click Consult with the hope of increasing both their organic traffic and search visibility across a number of key terms for their Online Doctor brand. 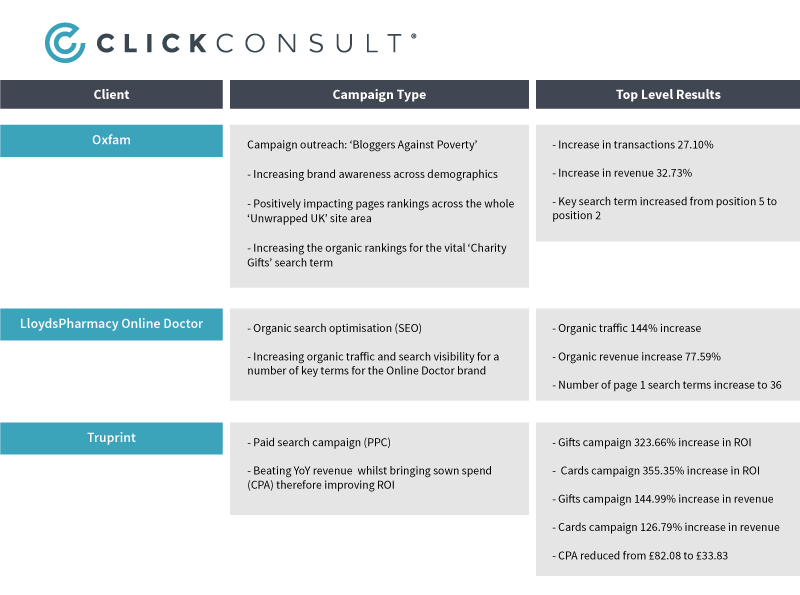 The client, having previously relied heavily on a PPC strategy to drive online traffic and sales, was convinced by Click Consult that an organic search (SEO) campaign would be a much more efficient and cost effective investment for their online marketing. This project came to us at a time when regulations in the pharmaceutical industry were tightening and when LloydsPharmacy faced stiff competition from their competitors for newly identified key terms. In order to make sure that LloydsPharmacy maintained their position at the helm of the market and increased their number of rankings for keywords in P1, we had to undertake an intensive keyword and competitor review before producing content that would increase performance. Another of the key deliverables for this campaign was to improve the return on marketing investment, (ROMI) by 20%. With a ROMI of 53.93% overall and some phenomenal gains in organic sessions and revenue, not only were we able to provide value for money for our client, but also raise awareness of a fantastic online service and improve overall customer experience. Find out what makes us such a special agency, drop us a line or give us a call on 0845 205 0292. By following these 5 simple steps, you can reinvigorate, reenergise and revolutionise your paid search performance.